Looking for cost-effective ways to improve the curb appeal of your home this season? One of the best ways to do this it is by repainting its exterior. Putting a fresh coat of paint on your home can make it look better than it has in years. But before you get started, there are a few things you’ll need to do to prepare. Scrape away any paint that has started to peel. 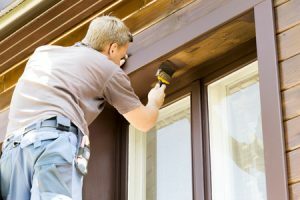 If it’s been a long time since your home has been repainted, some of the existing paint may already be peeling and flaking away from the siding. You should not simply paint over these sections, as this can cause your new paint to begin peeling prematurely, too. Instead, scrape away the peeling sections and sand the surface that’s left behind so that the new paint can adhere to the siding. Clean off mold and mildew. Is there any mold or mildew growing on the exterior of your home? You shouldn’t paint over this, either. Use a pressure washer and detergent to remove mold and mildew prior to painting, and try to eliminate the source of the problem if possible. In many cases, mold and mildew growth on siding is caused by leaky gutter systems. Remove and replace any rotted sections of siding. While you’re in the process of scraping away old paint and cleaning your siding, you may encounter a few sections of rotten wood as well. Don’t just paint over these problem areas and expect them to go away; remove any rotten wood you find and replace it with new wood to protect your home from environmental damage in the future. In addition to rotting wood, you may also find other minor imperfections such as cracks or holes in the siding. It’s a good idea to repair these imperfections prior to painting to ensure you’re able to get the best possible finished product. Most minor blemishes can be repaired with a little wood filler and sandpaper. At Lawrence Tool Rental, we have everything you need to tackle exterior painting jobs on your own, including ladders, paint sprayers and more. Just give us a call or contact us online today to get started!